BOTS. BIRMINGHAM. BIG BROWN BREAKFASTS. As am I, my friend. 17th-19th August at the Hilton Metropole. The days between TFNations are is merely the UnTime. What matters is what happens in a well-appointed midlands conference-centric hotel just once a year. I'll be there, and I'll have original art from Lost Light Covers, More Than Meets The Eye Pages and maybe, if I can be pushed, even Wreckers pages to sell. I'll also have the more affordable prints, this year featuring Lost Light, Wreckers Saga, a Verity Carlo/IDW 2005-2018 retrospective poster, and a few more surprises. * I will only be able to accept CASH at TFNation, no cards. * You can Paypal me AT the show if you can show me your digital receipt for the transaction. Hi Nick, it's Sprite, I'd like a headshot of Wreckers-era (any is good) Prowl please. I'll be around all weekend as usual! My name is Sam and I was hoping for a headshot of Hosehead. Hi Nick, I'd like a headshot of Earthforce/post-Unicron Prowl, please. I'll be around all weekend. Continuing what will be tradition, may I please request a headshot of the new Diaclone Big Powered GV (masked face)? Will pick up and pay at TFN, any of the 3 days are ok with me, can't wait to stick it next to your epic Dia-Battles from last year! Hi it's Richard, I'm there all weekend. Can I get a Kup (during his Cygar phase.) cheers. I'd like a commission of IDW/MTMTE LOCKDOWN. Something like a mugshot photo, maybe holding a mugshot sign if possible. I'd love to see him beaten up here and there but still with a big smug grin plastered on his face, that'd be awesome! 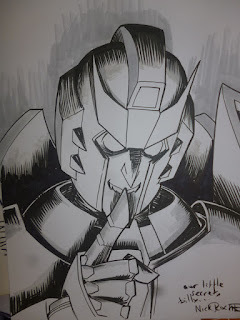 I'll be at TFN Friday to Sunday! Looking forward to seeing you! 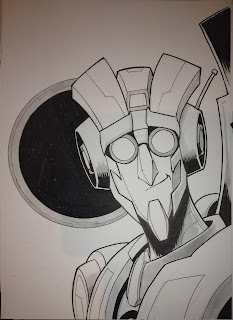 Hi Nick, I'm Tom I'd like a commission of Megatron (from The Last Knight) I'm around Fri-Sun. Thanks, look forward to seeing you! I'm Sean, may I have a head shot of Lost Light Megatron please. I'll be at TFNation all weekend. Thank you, looking forward to seeing you again. I understand that I'm asking rather late in the game so no worries if it's not feasible! Thanks in advance, and looking forward to seeing you there! Hi Nick, i'd like a headshot of Auntie please, (also already down for a torso of Tarn)- cheers. *Hi Nick- following up, i'm there Friday/Saturday and mid Sunday.